AUGUSTA, Maine—Upon entering the small city of Augusta (pop. 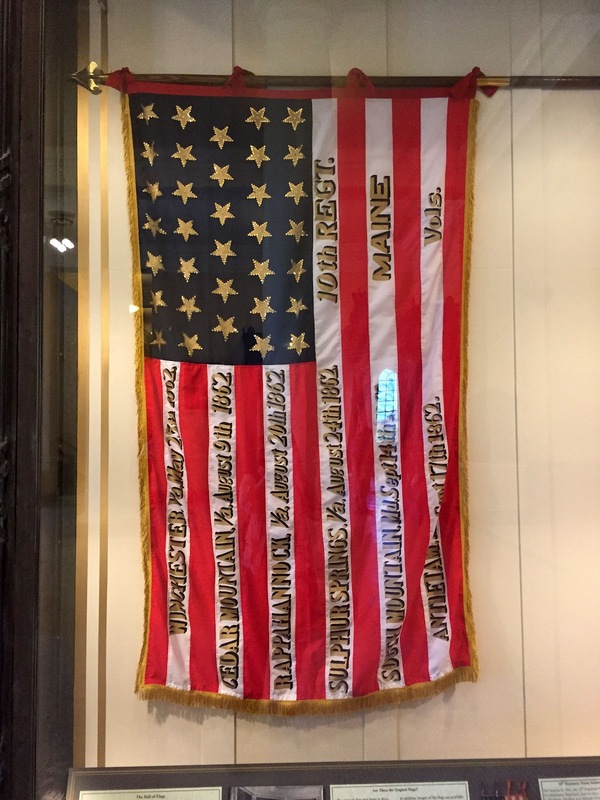 19,136), we had no difficulty locating the Maine State House. 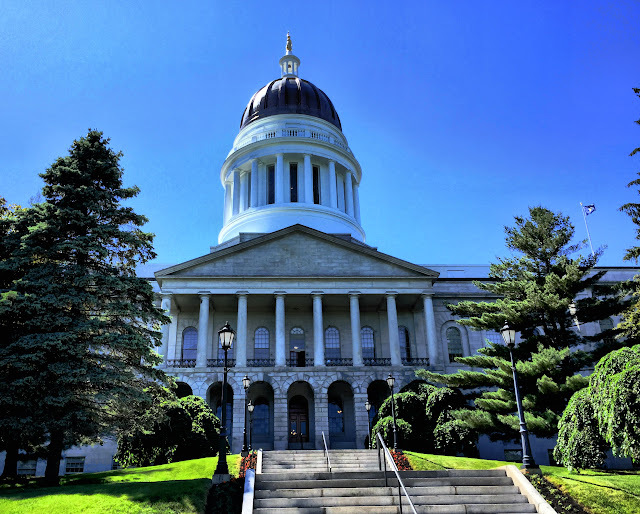 From its position on a hill overlooking the Kennebec River, the domed capitol is quite visible from the Maine Turnpike as you enter the city. 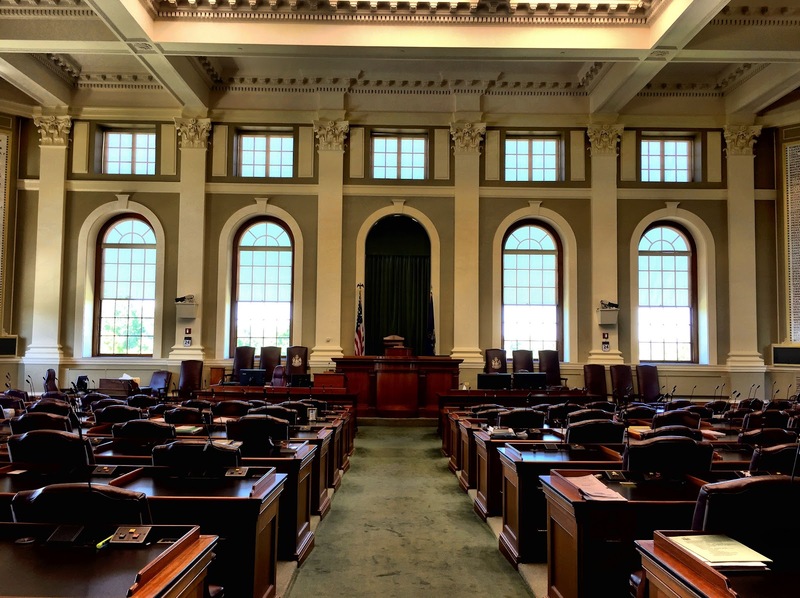 After Maine broke away from Massachusetts to become the 23rd state in 1820, a bit of jockeying ensued over the location of the state capital. Portland, still by far the largest and primary city of the state, was a popular choice, but its temporary status as capital was vacated due to its extreme southeastern location. Augusta—farther north and inland—was officially proclaimed the state capital by Governor Enoch Lincoln in 1827. Charles Bulfinch, a well-known American-born architect who designed the Massachusetts Statehouse and was doing some work on the national capitol, was hired to design the government building for Maine. 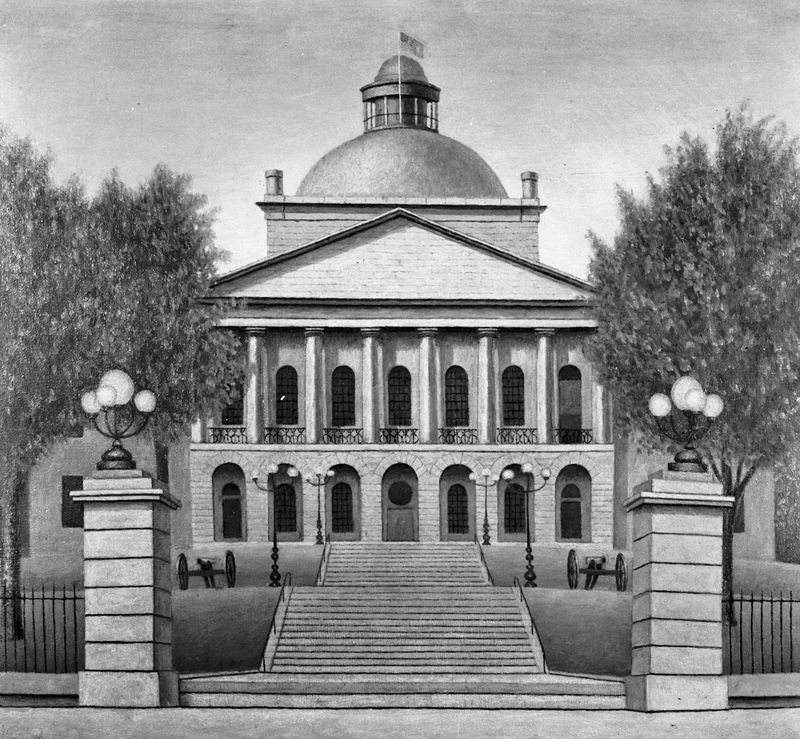 Drawing on his Massachusetts design, Bulfinch aimed for a simpler Greek Revival style which could be fashioned from local Maine granite. To serve the growing needs of a burgeoning government, the state scrapped all of the 1832 capitol building except the front portico and the wall behind it and doubled the size of the state house in a 1909-10 project. Bulfinch's center cupola was replaced with a copper-clad dome. Over time, the copper oxidized to a dull green. 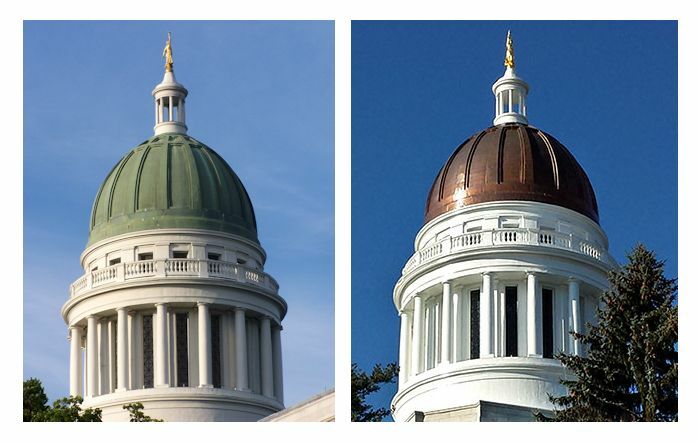 In 2014, the original copper sheathing on the dome, which had become leaky over time, was replaced. Today it is a flat brown and is expected to remain that color for another 30 or so years before oxidation restores the green patina. Visitor parking for the capitol was free and conveniently located across the street. Security screening was competent and standard—walk-through metal detector and bag x-ray. 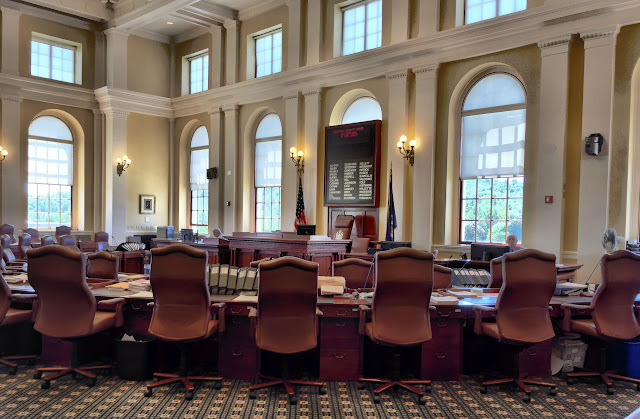 Near the exit to the security station was an information desk where a congenial state employee ensured that we picked up copies of the myriad and superfluous brochures about the state house. Arriving at 1:45, we were too late for a guided tour, so armed with plenty of (sometimes conflicting) information, we were on our own. In the center of the second floor, where we were told to begin our tour, we found the Hall of Flags, located under the dome but with a ceiling that blocked the view of the inner dome. Arrayed around the room were massive display cases exhibiting replicas of battle flags used by Maine military regiments in various conflicts from the Civil War to Korea. 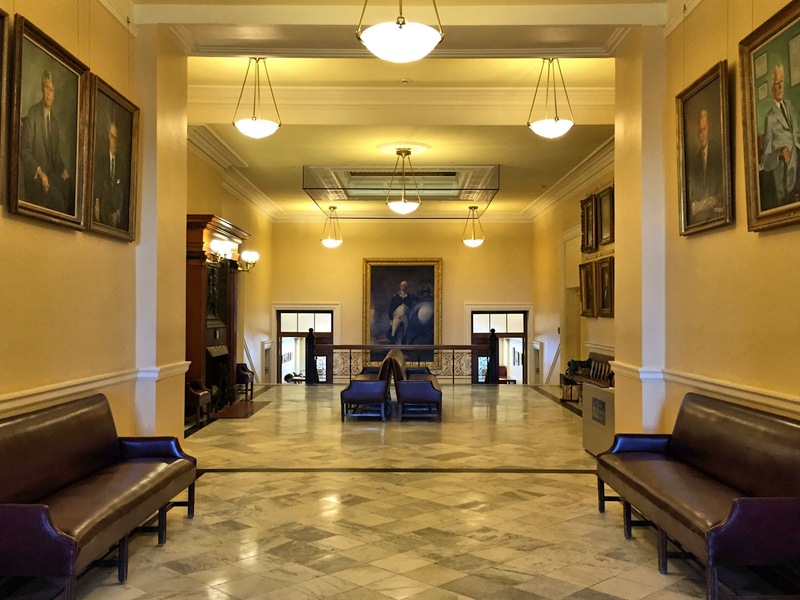 In the center of the hall is a bust of Percival Proctor, governor from 1921 to 1925. Over a 30-year period, Baxter used his immense personal wealth to amass more than 200,000 acres of wilderness land in north central Maine, which he donated to the state, becoming Baxter State Park. 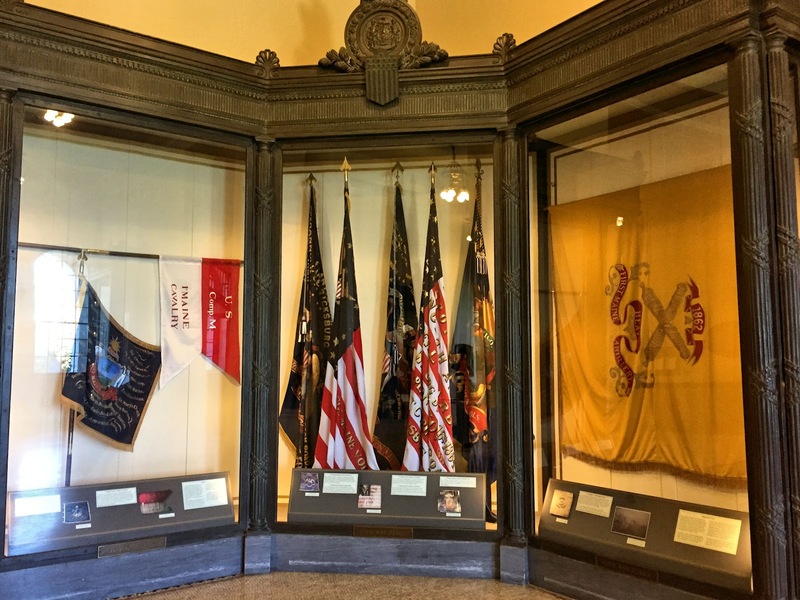 As we found throughout the building, light fixtures in the Hall of Flags were basic, ceilings unadorned. Only plain molding and trim decorate the walls, along with a collection of more than 140 portraits—governors, supreme court justices, state legislators and Congressional representatives, military heroes—a veritable conglomeration of prominent Mainers. 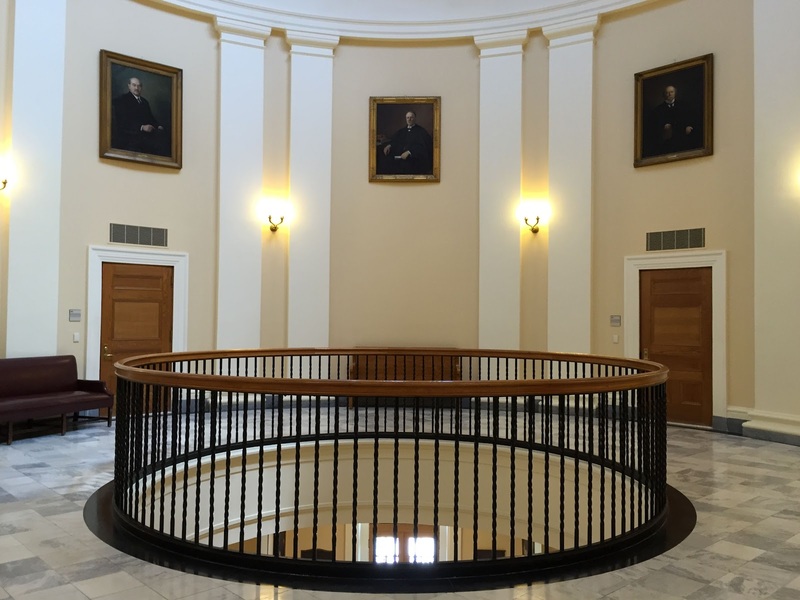 Placement of the portraits seemed to be random with a 20th century jurist next to a Civil War general. 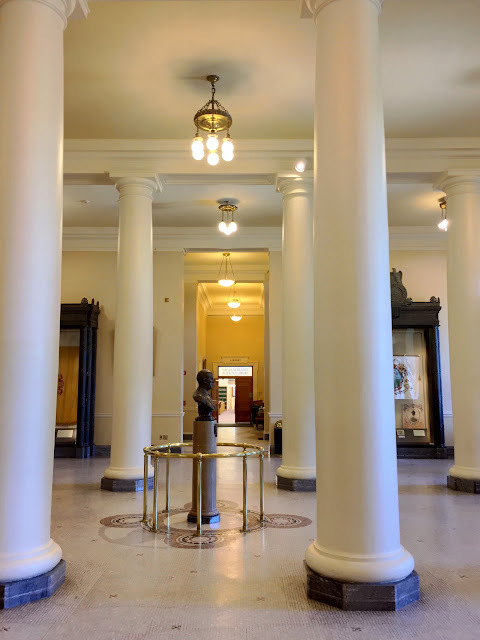 In one of the numerous pamphlets we were shuffling on our self-guided tour, we found the state's perspective on the lack of opulence in its capitol building: "Designed with restraint, the rotunda walls are relieved only by the simple lines of paired Doric pilasters and denticulated cornices." As we were to learn, the Maine State House is deliberately plain and simple, a reflection of the Puritan ethic and frugality of its people. 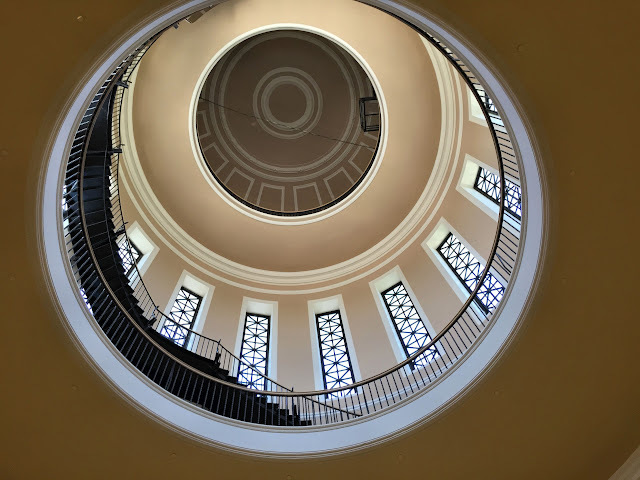 Upon reaching the third floor, we had our first look at the admittedly prosaic rotunda and the inner dome above it. Apparently the restraint was extended to the dome as well. Its most prominent feature was a bulky black iron staircase that wound around the interior. Despite the lack of ornamentation, one feature the re-design architect, G. Henri Desmond, did not scrimp on was natural light. It is the most arresting feature of both the House and Senate chambers, which also include considerably more molding and trim than any other parts of the building and even a coffered ceiling. 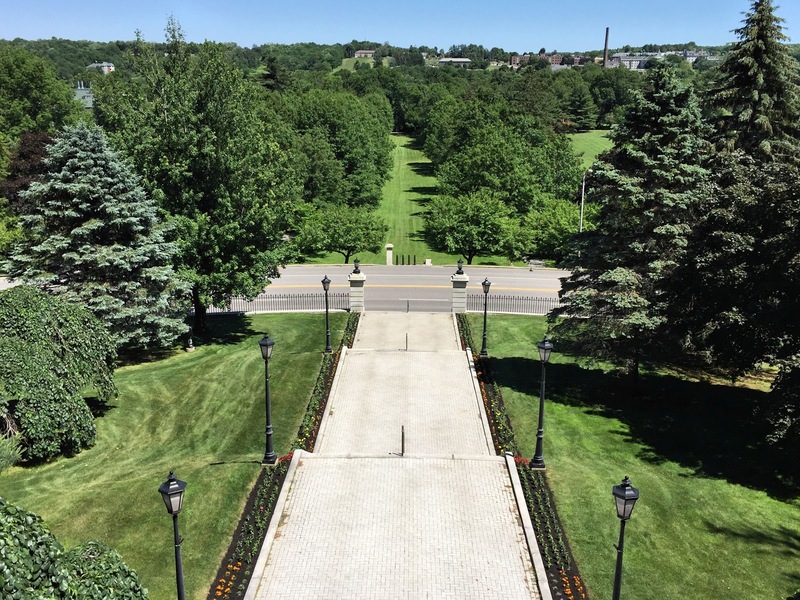 Stretching between the State House and the river is a lush green landscape known as Capitol Park. Over the years, the park has functioned as parade grounds, camp site, and even leased farmland. Today it offers walking trails lined with oaks, beeches and pines and is home to Governor Enoch Lincoln's tomb and several memorials. Building height (to tip of dome): 185 ft.